In the final thirty kilometers’ drive back to my home in the Catskills, along a vacant highway through hills of leafless winter trees colorless and devoid of any sign of life, I inexplicably recall my recent journey in a distant known-but-unfamiliar land. Just a few weeks before, I’d traversed a profoundly different landscape en route from Baghdad to Kerbala city in Iraq. My Kerbala host and I had quipped that the two hours plus required to reach Kerbala that day was the time I needed to drive upstate from New York city. Except that that holy city is hardly 50 miles from the Iraqi capital. Scores—no, thousands– of military checkpoints slow every kind of movement within Iraq today. I first traveled to Kerbala 27 years ago, visiting the magnificent Al-Hussain shrine and the city’s general hospital, also named Al-Hussain. On every visit to Iraq during the fierce 13-year embargo (from 1990 to 2003) against the nation– starting in April 1991 when evidence of a government attack against rebels hiding there was still in evidence– I made my way to Al-Hussain General Hospital. 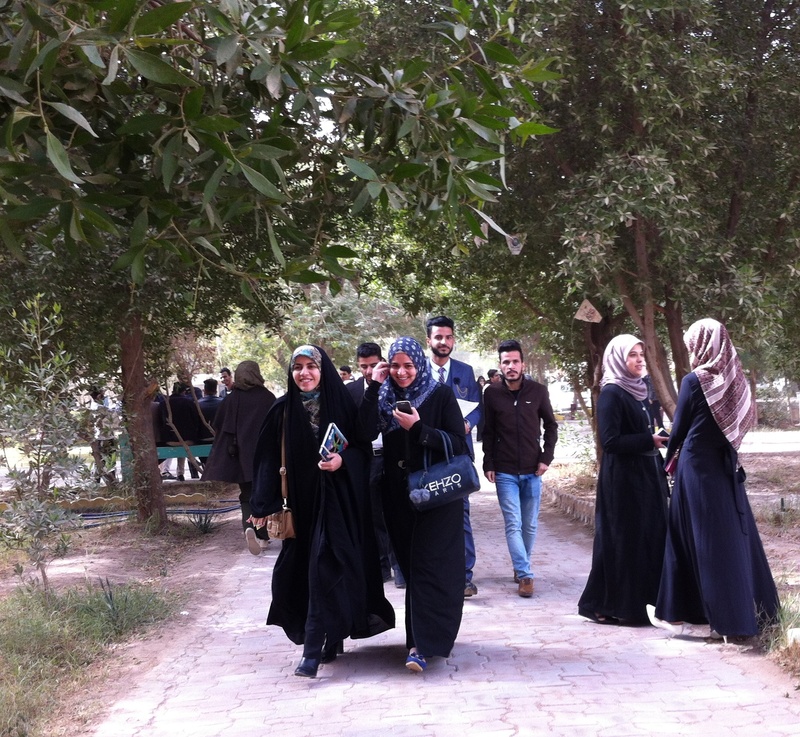 On subsequent annual visits, the hospital’s medical staff uncomplainingly helped me document the crime of sanctions, the U.S. campaign deliberately decimating Iraq’s once exemplary health system (along with the entire economy and civil structure). The four lane highway to Kerbala, the major route into south Iraq, is divided by a wide median. Unlike the vacant fields that stretch to a horizon of palm trees to my right, the median is planted with shrubs and trees. And tributes. Among the few private cars heading south, I see an occasional small bus. Most vehicles are large transport trucks, and those heading toward Baghdad carry imported goods from Basrah port, or earth from excavation sites in the south. Although crossing through farmland, viewed from the road there’s little sign of cultivation. Perhaps this is because of the dearth of rain this season. (I would later learn Iraq’s agricultural industry is badly neglected.) Occasionally we overtake a pickup truck loaded with sheep or with vegetables. What roadside structures we pass, auto-repair stations or cafes, look unkempt and uninviting– part of the generally colorless landscape. Now and then I notice a cluster of children in uniform and toting bookpacks, strolling towards their local school. In the median in the center of the highway is a sight far more compelling and throughout this voyage my eyes refocus there. This is not because of anything alarming or troubling. It’s the stream of arresting, insistent images posted there:– each one a different face, each a martyr of the recent wars (the costly fight against Daesh/ISIS). This silent parade constitutes a kind of running panorama of the battles for Iraq, for its sovereignty, for its honor and its history. The faces are mainly of young men, most likely no more than 30 years old. Although occasionally, the portrait of an older man, probably an officer, enters this landscape. 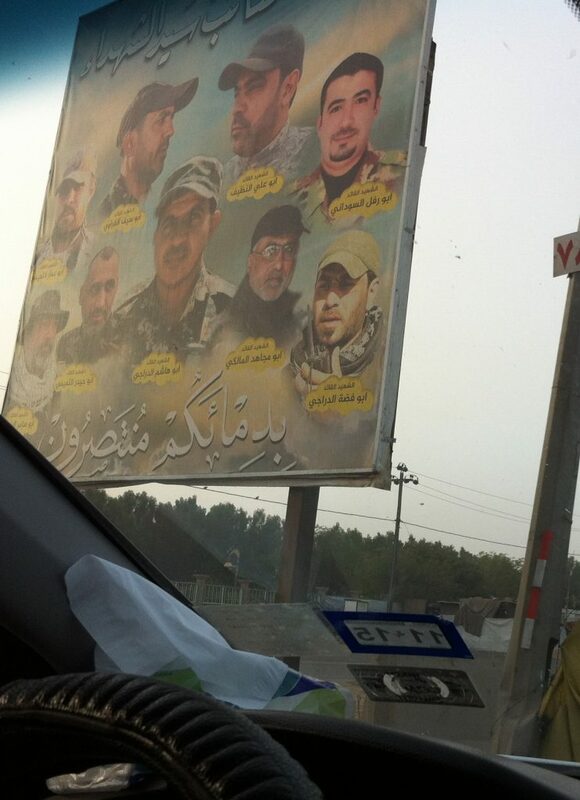 All the way to Kerbala, and southward to Al-Najaf and beyond in all directions, Iraq’s roads and highways are adorned with the names and faces of soldiers, most of them volunteers, a placard every few hundred feet, sometimes two or more photos on a single notice. These martyrs’ banners are posted high, like flags, in rows– mile after mile. Each name a story, each a family’s son, each a patriot, each a sacrifice. For me, a visitor, they evidence the history of what war and nationhood mean. Today, back in the USA, I ask: Is that vista so different in its meaning and impact on Iraqi citizens from how fields of simple white plaques or crosses at French and Belgian Flanders, at Arlington National Cemetery, or the amassed names on the Vietnam Veterans Memorial, affect Europeans and Americans? Although martyrdom may be central to Shiite history, belief and culture, it is deeply embedded in other societies. In Arab culture and thought—martyrdom is expressed in our language as well as our religion. A man can be named Shaheed (pl. Shuhadah) in some countries (see this and this), and street names are prefixed with Shuhadah. The portrait of a martyr has a special place in his family’s home. A pity that people in the dominant Christian society of the West cannot grasp the universal qualities of the martyr. Was Prophet Jesus Christ not a martyr? As for those who die in battle, sacrifice for the American homeland is visibly displayed today in the high status accorded its soldiers killed in Iraq and Afghanistan, in inglorious wars moreover. What is “Gold Star Family” but a title honoring American military martyrs? U.S. veterans, especially the wounded, are heaped with praise for their service and they’re given unlimited government assistance. Even radio and television features regularly tell Americans of ‘noble sacrifices’ of troops in Iraq and Afghanistan. Those stories of hardships, trauma, and handicaps transmit a feeling of martyrdom. Then come civilians martyred in the daily racist war on America’s streets, deaths that awaken calls for social change. Not co-incidentally it was a religious leader, Reverend Jesse Jackson, who recognized martyrdom in the death of a Black child gunned down for his race: “We must illuminate the darkness with the light that comes from the martyr,” Jackson implored after the death of 14-year old Trayvon Martin. The paths of martyrs are endless and boundless.